The company confirmed that it's in talks to sell itself. Shares of Synaptics Inc. (NASDAQ:SYNA) surged on Wednesday after the company confirmed that it was talking with Dialog Semiconductor (NASDAQOTH:DLGNF) about a potential acquisition. Synaptics stock was up about 12.1% at noon EDT. Bloomberg reported on June 8 that Synaptics was discussing selling itself to Dialog. On the same day, CNBC reported that Dialog had made a bid of $59 per share, which was rejected by Synaptics. Synaptics declined to comment at that time. With Synaptics now confirming that talks are ongoing, it would seem the odds of a deal being signed have increased. The price would likely be higher than the original $59 bid, and an analyst at KeyBanc sees a price as high as $70 per share as possible. Over the past 52 weeks, Synaptics stock has traded between $33.73 and $61.18 per share. Following Wednesday's rally, it sits just shy of $55. Synaptics doesn't plan to make any additional comments about the talks, and the company said that "there is no assurance that a transaction will result from these discussions." 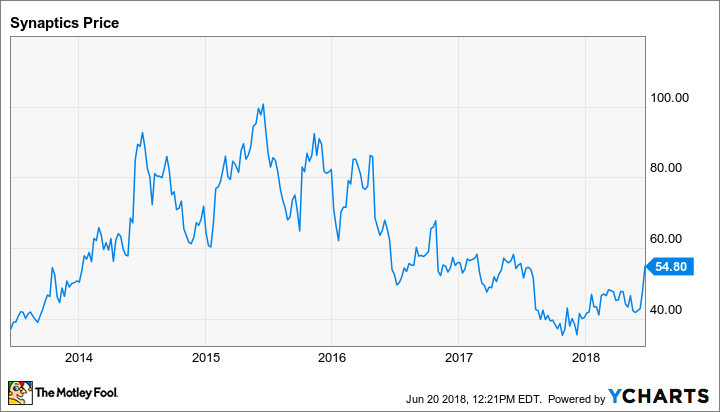 Synaptics stock has been hammered over the past few years, falling from a multiyear high of around $100 in late 2015 to below $40 in late 2017. The company has struggled to grow revenue and earnings, reporting an 11% year-over-year revenue decline in its fiscal third quarter, along with a steep drop in adjusted net income. Sluggish demand for smartphones is taking a toll on demand for the company's touchscreen, display driver, and fingerprint products. With Synaptics stock still below the reported rejected offer price of $59 per share, the market doesn't seem all that optimistic that a deal will get done.